Sat urday 1 June at 7.30pm – our joint charity concert with the Cambridge City Brass Band at Letchworth Free Church. 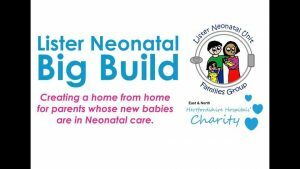 All proceeds to the Lister Neonatal Big Build, for better facilities for parents with babies in Neonatal care. Back to Providence Court Care Home in Baldock for our Christmas Carol singalong. At Letchworth Free Church, supporting Garden House Hospice, during the Christmas Tree Festival weekend. 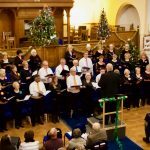 Garden City Singers performed a host of Christmas classics and some choral faves! Audience participation was guaranteed and there was mulled wine and mince pies for all. 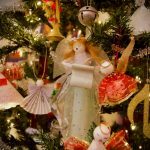 Funds raised for the Hospice over this Christmas Tree Festival weekend will include the donation made by GCS! 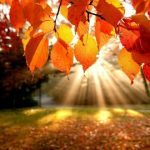 Keep an eye out for announcements by the Hospice. At Trembaths Care Home, Letchworth from 2.30pm. Our popular Singalonga event with our treasured seniors comes to Trembaths this Saturday. 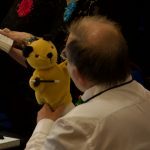 At Garden City Court, Whiteway Letchworth from 11am, back for our second visit this Summer, we loved lifting the spirits of our valued seniors. Our FREE cream tea concert at Dunton Parish Church raised over £100 in aid of the Church fabric fund. Garden City singers were proud to take part in an event commemorating our fallen men and women, singing in Broadway Gardens as part of Armed Forces Day. 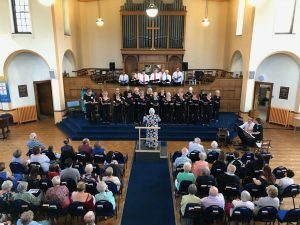 We were delighted to celebrate the 80th Anniversary of St Thomas’ Church Wilbury, performing at a fund raising event for them on Saturday 23 June. Not only was nearly £300 raised for Jackie’s Drop in Centre, funds were raised for the church fabric and a donation was made towards our chosen charity – Macmillan Cancer Support. 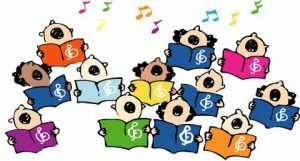 Dunton September 2017Autumn 2017 got off to a flying start when we performed our 3rd annual cream tea fundraising concert at Dunton Parish Church. Almost £200 was raised for the church fabric fund. Then on the 10 November at St Francis’ College we helped celebrate 30 years raising funds for the Kanyike Project. Garden City Singers opened the show which was included many other artists and performers and helped contribute towards much needed funds for one of our favourite causes. More details available here. Our Christmas concert, this year featured the Biddenham Hand Bell Ringers. 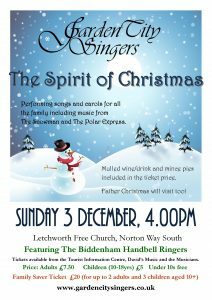 Find out more about Biddenham Hand Bell Ringers here. Photos coming soon! We sang for these lovely ladies, who enjoyed joining in the fa la la! Booked to sing for them again in 2019 already. 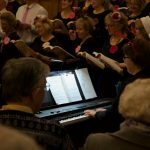 One of our favourite places to visit at Christmas, we sang carols with the residents again this year and had so much fun we went to their sister home at Garden City Court on Friday 15th December. 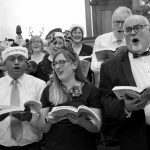 Singing at Sainsbury’s, Letchworth Retail Park 17th and 20th December. 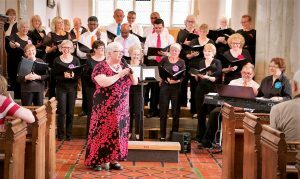 For our third consecutive year we are sang in Sainsbury’s Letchworth to raise funds for their chosen charity. In 2017 they supported Heathlands Animal Sanctuary. For more info about this charity click here. Lots of lovely customers generously donated to this charity and joined in singing and ringing the Jingle Bells.